The Neem tree (Azadirachta indica) grows in tropical and sub tropical countries such as India, Africa and Australia. It belongs to the family Meliaccae, and is a cousin of the Chinaberry. It may reach up to 15m tall under ideal conditions, and is reported to live for up to 200 years. It has a short straight furrowed trunk, dark brown or grey in colour, with dense rounded crowns of pinnate leaves. It can tolerate temperatures of up to 120 deg. C, and rainfall as little as 45cm. It must have well drained soil, and will respond well to organic fertilisers - although being hardy, it can still grow luxuriantly in marginal and leached soils, up to an elevation of 1500m. Flowering is between February and May, with profuse clusters of small white flowers having a very sweet jasmine or honey-like scent. The flowers provide a good source of nectar for bees. Following on from flowering, the fruit are green drupes, turning golden yellow on ripening, which occurs during June, July and August in India. The fruits are about 1.5 cm long, edible, and loved by African children. The tree will normally begin bearing fruit after 3 to 5 years, and produce about 50 Kg annually when mature. The kernels of these fruits yield about 45% neem oil. The bark yields tannin and amber hued gum, used as a dye in textiles as well as the traditional medicinal usage. 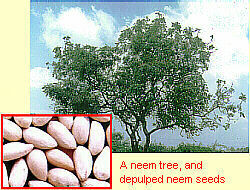 The Neem tree is related to mahogany, and is used locally for furniture and building purposes. The inherent properties of Neem make it resistant to termites. In India, it has not tended to be a 'plantation' species, and is seen along the roadside and in gardens. Local tradition dictates that Neem trees should be planted near the home to ensure good health to those that live there. Indian culture dating back 4000 years makes reference to using the leaves, fruit and bark of the Neem tree for reputedly easing a variety of human ailments. The earliest Sanskrit writings outline its uses, which have been revered by Ayurvedic and Unani practitioners. The time honoured title 'Villlage Pharmacy' has been earned by virtue of its amazing properties. In 1922 a British archeologist discovered the 5000 year old Indus Valley site in North Western India (now Pakistan), where the Harappan civilization has been extensively studied. Clay pots were found containing medicinal herbs, most prominently Azadirachta indica or 'Neem'. The early systems of use, though simple, have stood the test of time - and are still used today in many parts of rural India. Fresh leaves are often picked and stored along with grain, or under mattresses to repel insects. Wounds are bathed in water boiled with neem leaves (decoction). Twigs of the neem tree are used daily by about 600 million people as a 'natural' toothbrush . In tropical countries, it is common practice to take neem leaf with the diet, and to make a paste from the leaves to use as a poultice. Nimbin - Nimbidin - Nimbidol - Gedunin - Sodium Nimbinate - Quercetin - Salannin - Azadirachtin. Extensive research has revealed the many & various beneficial properties they deliver. The oil is also rich in long chain fatty acids. In addition to the active ingredients listed above, analysis reveals many other vital nutrients: fibre, carbohydrates, calcium, at least ten essential amino acids and also carotenoids which are powerful antioxidants. The beneficial properties of neem have led to its' inclusion in personal care products, such as soaps, shampoos and skin creams. Neem has been heralded: 'An Ancient Cure for a Modern World'. 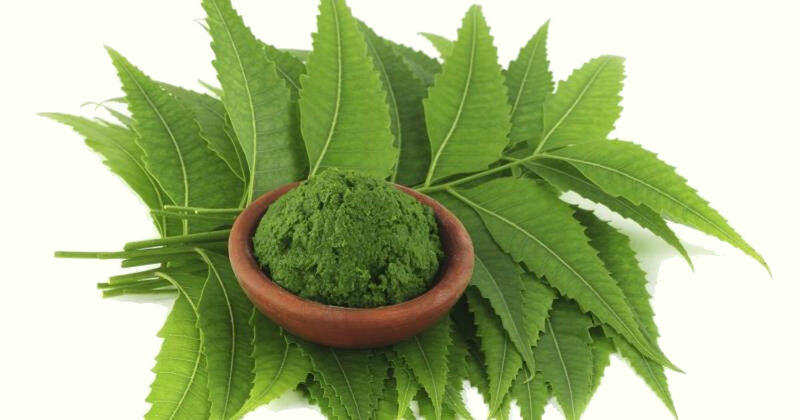 As we begin the 21st Century, Neem has been little known and under-utilised in Western culture. However, with bodies such as the National Research Council (USA) declaring Neem 'A tree for solving global problems' - the future seems optimistic. Requirements in the West are more exacting and stringent in respect of quality control assurances, but this is achievable by using carefully sourced raw materials from reliable and ethical sources, and using state of the art manufacturing technology. This process utilises carbon dioxide at critical temperatures and pressures to extract the active ingredients of the neem leaf (or indeed, any other herb), without the usual high temperatures or harsh chemicals. This results in a far more concentrated extract, which closely resembles the fresh herb. Our neem is extracted shortly after harvesting to capture the beneficial phytochemicals (the plant's natural ingredients) with superior potency and purity. These extracts are offered as a dietary supplement, or in some cases, supercritical extracts are found in the ingredients lists for several of our personal care products. Many conventional extracts use heat, alcohol or other chemical solvents such as butylene or propylene glycols, acetone and other petroleum derivatives. Super Critical Extracts are superior for many reasons. Beneficial phytochemicals are easily damaged by heat, and there is also a growing desire for alcohol and solvent free natural extracts. Additionally, many phytochemicals are not soluble in water and alcohol or oil. The supercritical extraction process enables delivery of a broad spectrum of phytochemicals, including both the lipophobic (water soluble) and lipophilic (oil soluble) isolates. Conventional water and alcohol extracts contain only the lipophobic components. However, it is often the lipophilic components that are the most beneficial. The Super Critical Extraction process results in an herbal extract that is very potent (often more than 100 times stronger than conventional extracts), very pure and broad spectrum, closely resembling the herb in its' whole form. In addition, this extraction process uses only carbon dioxide as a solvent, which once the pressure is let off, evaporates completely from the extract - leaving it totally pure and free of any solvent residues.When you increase pressure, temperature also increases. When you compress a gas, it will become a liquid. The 'Super Critical Point' is the exact temperature and pressure at which a gas becomes a liquid. In the case of carbon dioxide, this is a relatively low 31deg. C Compressed CO2 at this point has the density of a liquid, but the properties of a gas. As such this aids in faster diffusion of the phytochemicals (almost twice that of other liquids), whilst the liquid-like state helps in better solubility of the phytochemicals. Once the extraction is complete, the pressure is released and the CO2 is harmlessly released. In reality, the raw botanical is placed into the extractor vessel. Liquid CO2 is heated to its' supercritical state, and pumped into the extractor. The SCO2 mixes with the botanical, and carries the desired extract into a separator tank, where pressure and temperature are controlled. The extract is precipitated in the separator, and CO2 is recycled into the extractor via a condenser. The process is very environmentally friendly. Many of our products contain supercritical herbal extracts of neem, and some have additional supercritical herbal extracts included in the formulation. These extracts help improve the potency of the formulae.